Of the many different sports played around the world, there are some that are made up of combining two or more current sports or events to create a new sport, usually performed consecutively. See also Hybrid Sports. Biathle — consists of swimming and running as part of a single race. It is usually over a shorter distance than the similar Aquathlon. Aquathlon — a continuous race involving swimming followed by running. It is usually over a shorter distance than the similar Biathle. Duathlon — similar to triathlon, running first, then cycling, then running again. Ski Archery — involves skiing and shooting arrows at targets. Aquabike - a shortened version of triathlon, with no running leg. Athletes swim followed by cycling. Chess boxing – a hybrid sport which combines the sport of boxing with games of chess in alternating rounds. Nordic Combined — a Winter Olympics sport in which athletes compete in a combined event of Cross-Country Skiing and Ski Jumping. Winter Triathlon — athletes compete in running, mountain biking and cross-country skiing. Cross Triathlon — a variation of the traditional triathlon, with swim stage, mountain-biking stage and a trail-running stage. Triathle — a shortened version of the Modern Pentathlon, athletes compete in shooting, swimming and running events as a part of a single race. Paratriathlon — for disabled athletes, involving a 750 m swim, a 20 km bike with handcycles, bicycles or tandems with a guide, and a 5 km wheelchair or running race. Quadrathlon — an endurance sports event composed of the four individual disciplines of swimming, kayaking, cycling and running - also called quadriathlon. Tetrathlon — composed of 4 out of the 5 disciplines of Modern Pentathlon: Swimming, Running, Shooting and either Fencing or Equestrian. Ironman Surflifesaving — combines four major aspects of surflifesaving into a single race: swimming, board paddling, ski paddling, and beach running. Medley Swimming Relay — a swimming race in which teams of four race consecutively. Modern Pentathlon — an event in the Olympics that comprises five events: fencing, 200m freestyle swimming, show jumping, and a combined event of pistol shooting and 3200m cross country run. Ancient Pentathlon — the ancient Olympic pentathlon was an athletic competition which consisted of five events, running, javelin throw, discus throw, long jump, and wrestling. Athletics Pentathlon — a no longer held event comprising long jump, javelin, 200-meter run, discus, and 1500-meter run. Military Pentathlon — a competition involving a shooting phase, obstacle run, obstacle swimming, grenade throwing, and cross-country running. Naval Pentathlon — comprises an obstacle race, life-saving swimming race, utility swimming race, seamanship race, and an amphibious cross-country race. Winter Pentathlon — was a demonstration sport at the 1948 Winter Olympics, which involved a 10km cross-country ski race, pistol shooting, downhill skiing, fencing and a horse jumping equestrian course. Heptathlon — a women's track and field multi-event comprising 7 events. 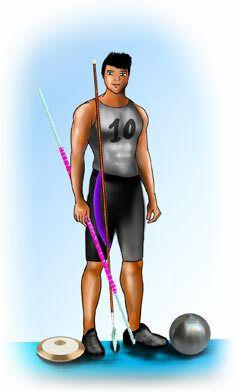 Decathlon — a men's track and field event comprising 10 events. Aeronautical Pentathlon — despite the name, the sport has 6 events: shooting, fencing, orienteering, basketball skills, obstacle course and swimming. Adventure Racing — an event combining two or more endurance disciplines, such as Orienteering, Cross-Country Running, Mountain Biking, Paddling and Climbing. It is also called Expedition Racing. Icosathlon — a double decathlon consisting of 20 events, including the 10 traditional decathlon events with 10 additional track and field events. Tetradecathlon — a double heptathlon consisting of 14 events, including the 7 traditional heptathlon events with 7 additional track and field events. Hybrid Sports - made up of combining the attributes of two or more current sports to create a new sport.